Sloooovakia! Leaving the fast-paced life behind. 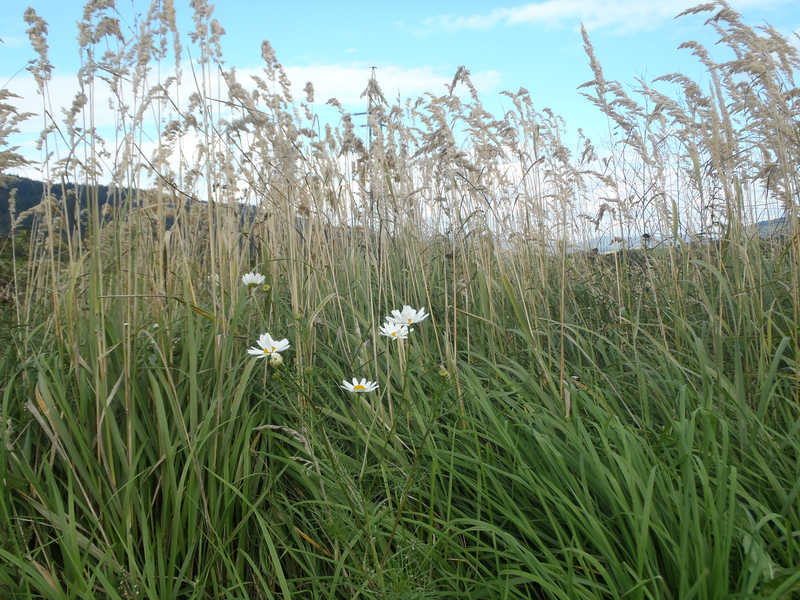 When we last left the story, we had escaped the frantic pace of Prague and we were cruising the back-country lanes of Slovakia. We arrived in Martin in the late afternoon and got settled at the St. Martin Hotel. Their aren’t really ‘hotels’ in Slovakia… we stay in places that are more like a cross between a motel and a Bed & Breakfast. There were always comforters with duvet covers, folded sideways on the beds. Quaint and adorable. 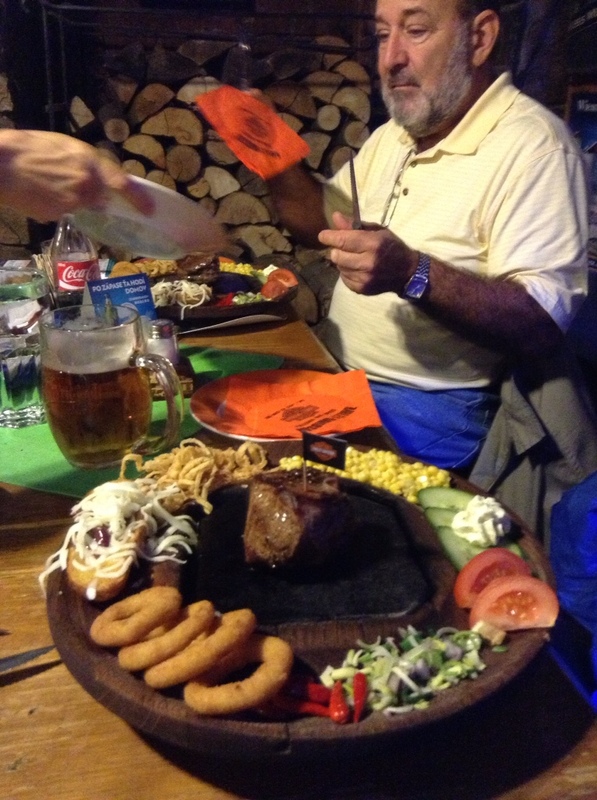 Dad has eaten there 3 times and always orders the Flintstone Platter; a sizzling slab of rock with a chunk of meat cooking on top! With full tummies, we headed back to the pension and off to bed. The first day in Slovakia was a SUCCESS! After an (almost) uneventful breakfast (Dad’s ‘French Toast’ was covered in salty sheep cheese!) we hit the road. 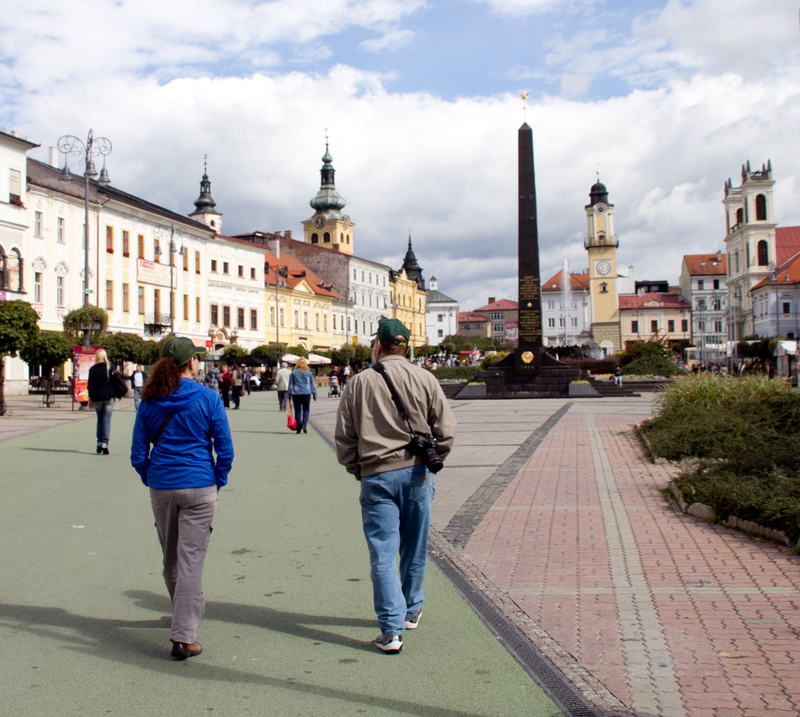 Heading to Banska Bystrica to cruise the pedestrian walkway and explore the gorgeous downtown. There were clarinet-playing buskers serenading us with Stevie Wonder songs, a HUGE rock fountain and a whole slew of lovely saints, carved out of marble. 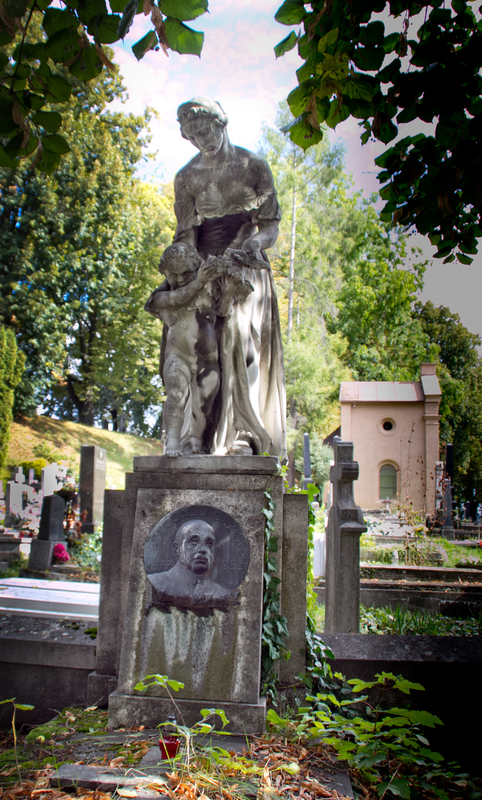 We strolled through the cemetery and then went in search of lunch. We found a lunch special at a cute little restaurant in the lower level of an alley but had a bit of trouble with the menu. 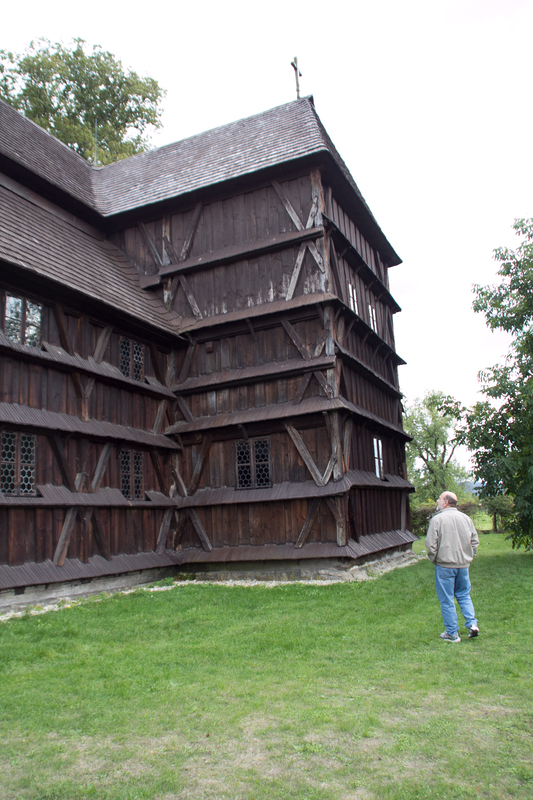 After lunch we headed out of town and headed to Hronsek, to see a 300 year old wooden church. 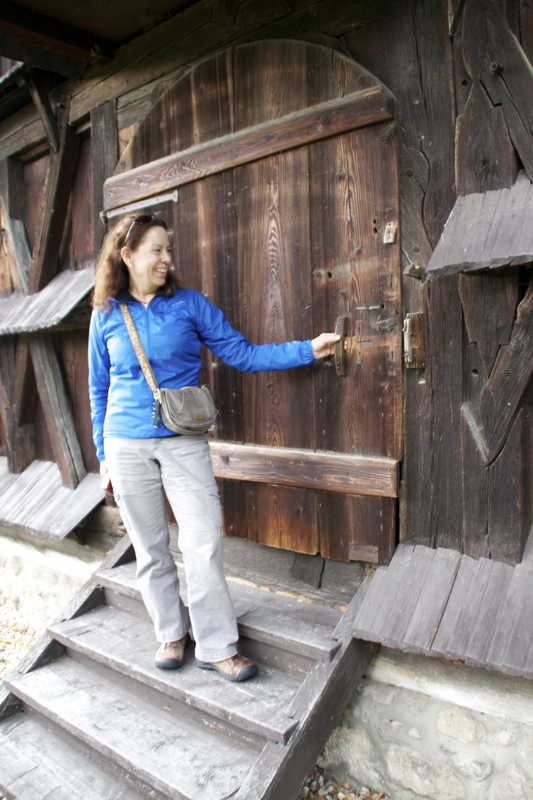 Slovakia is famous for their wooden churches, many with onion domes. Their interesting designs stem from a 1681 set of restrictive laws that were placed on the building of Protestant churches. Construction must be completed in 365 days. Church may not have a steeple/ bell tower. The front door may not be directly on the street. The Hronsek church is what they came up with in 1726. I’m pretty shocked that an uncoordinated altar boy didn’t accidentally burn it down, considering they must have held candle-lit services for many of those years. 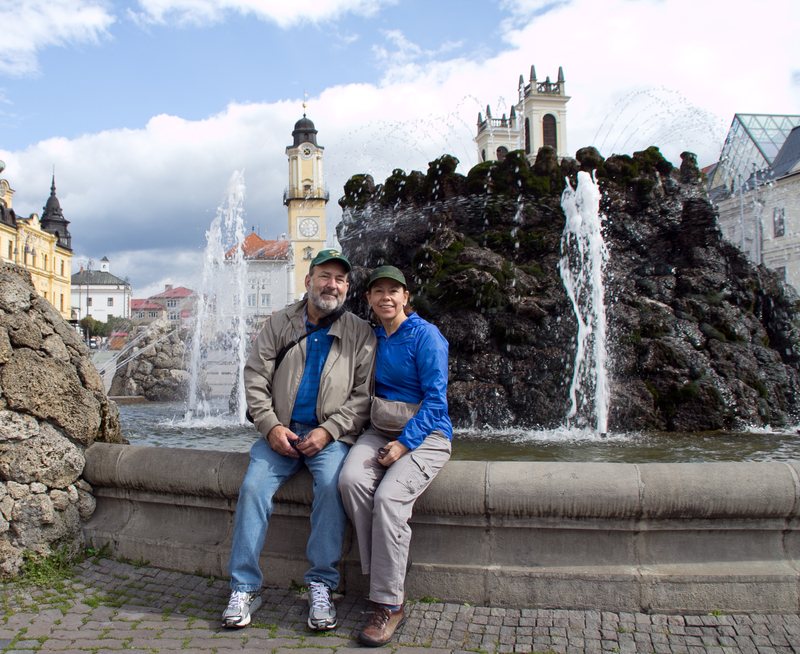 Next, we head to Nitra- Dad’s favorite Slovakian town! We stay Friday night at the Pension Zorboska. Geraniums in the window box! No screens! 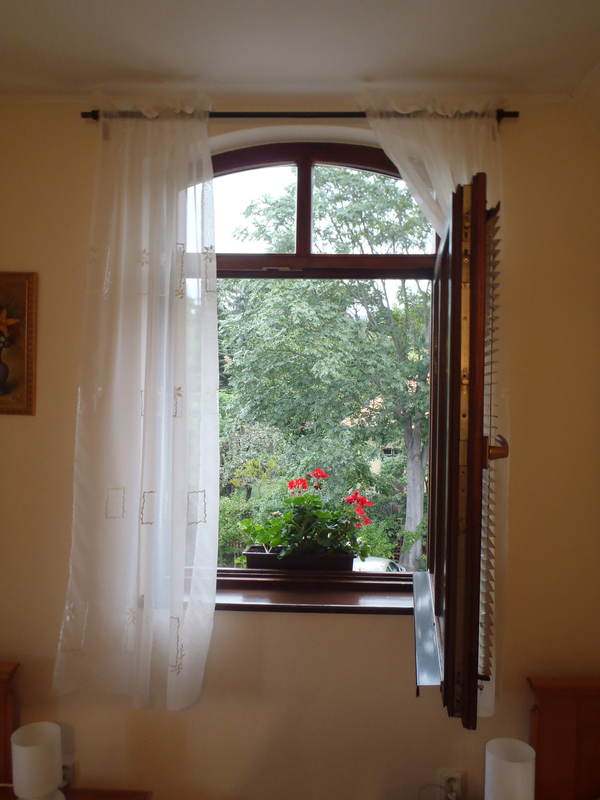 Plus, cool windows that can be opened from one side or tilted in from the top so the blinds can still be drawn. 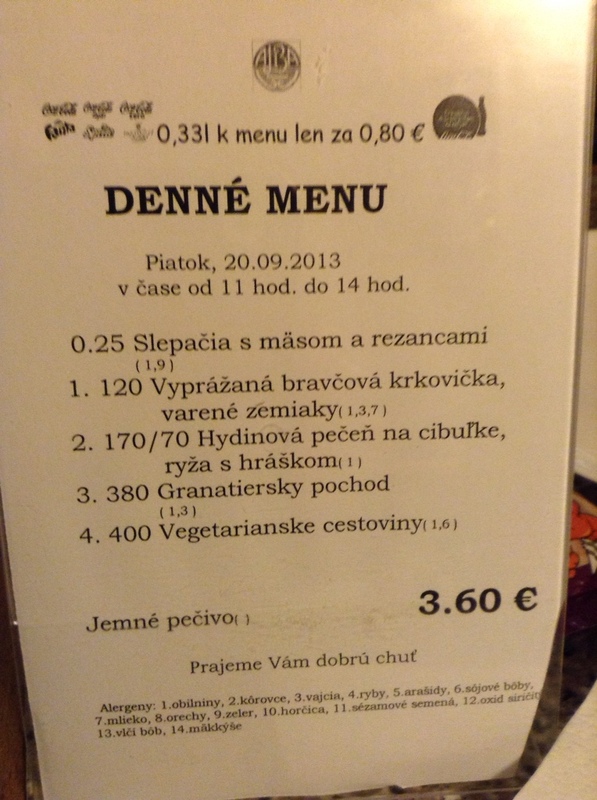 We walked into downtown Nitra for dinner. 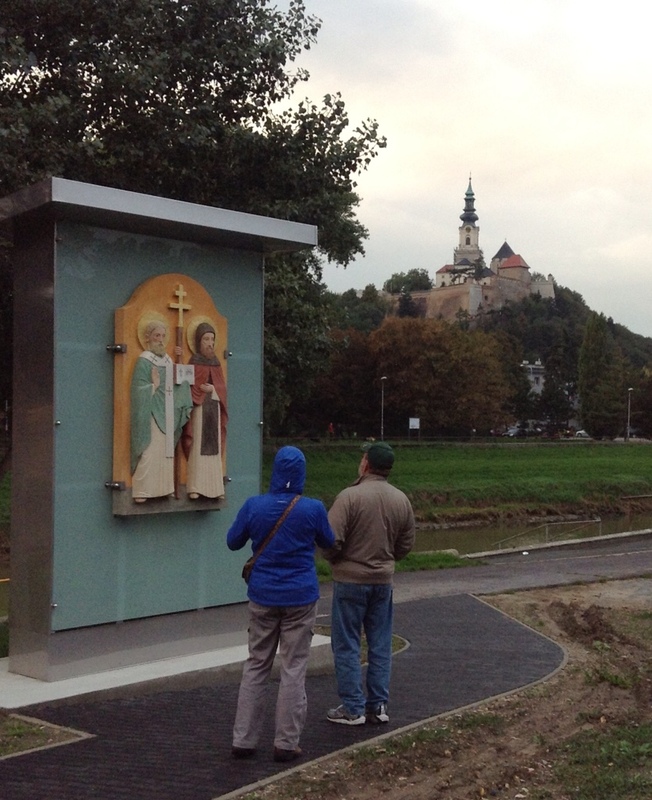 On the way we passed a new art installation honoring Cyril & Methodious – Slovakia’s patron saints who brought Christianity and written language to the Slavic people. 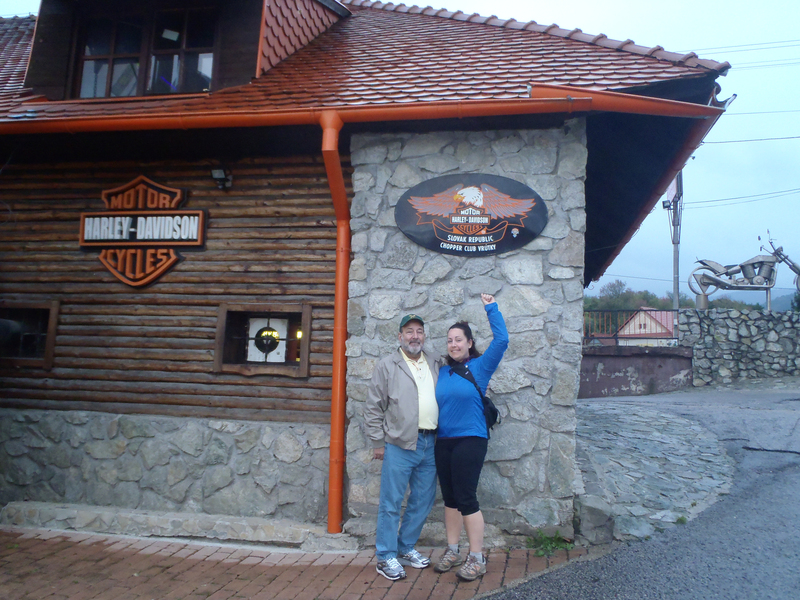 Even half-way around the world, Mom & Dad show their Spartan Pride! 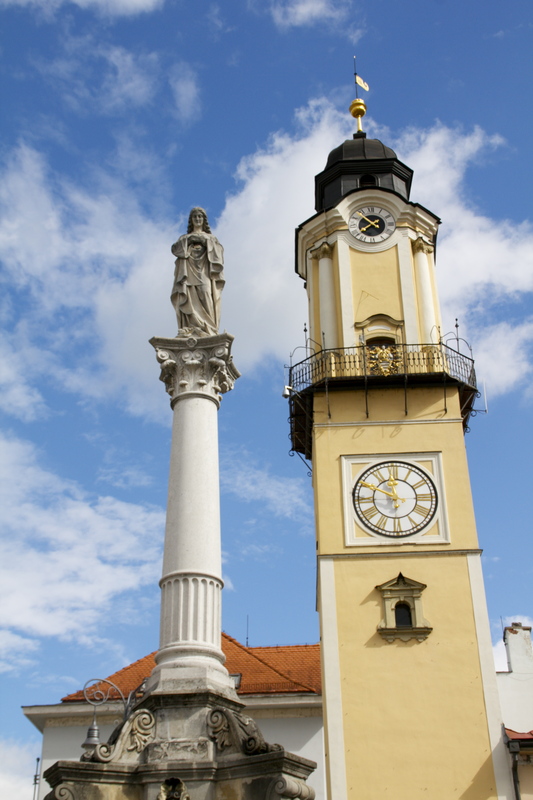 We keep walking through town, til we get to one of Dad’s favorite parts of Nitra- the ‘Nameste’- or central square. It’s got a fancy fountain with color-changing lights! 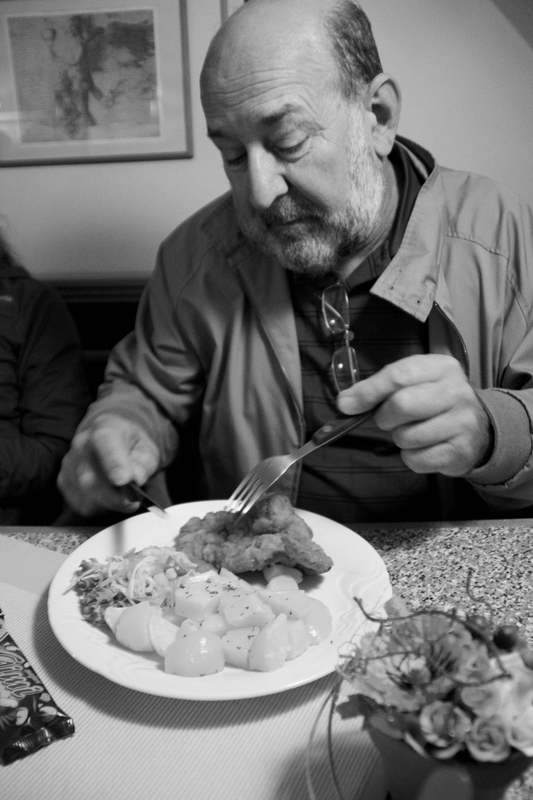 Our hunger forced us to move on… until Dad found an Italian restaurant and we had a great dinner. Yum- lasagna and arugula pizza! Dad also drank three glasses of ‘apéritif’… which Mom described as ‘cough syrup with bubbles’. Blech. Full & happy we walk Back to the Zoborska to bed down for the night! 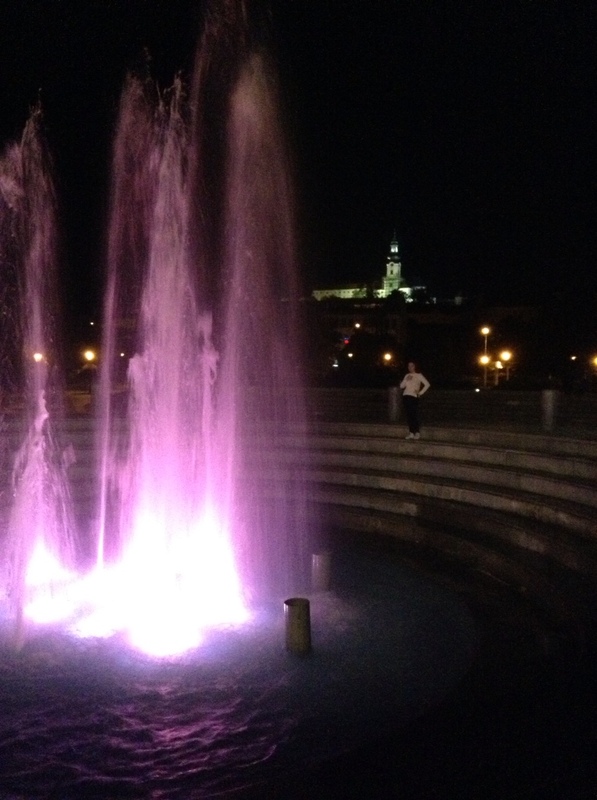 Previous Article Leaving Prague… if our car isn’t impounded! Next Article Slepacia, Slivovecia and wood-fired pork knee! Oh my! Loved reading this about the mother land!